According to US Code Title 4, Chapter 1 Section 8k, "The flag, when it is in such condition that it is no longer a fitting emblem for display, should be destroyed in a dignified way, preferably by burning." If you have personal, municipal, or business flag that is worn, tattered, faded, torn, or not in perfect condition, it should be retired and replaced with a new one. Please bring your flag to American Legion Post 208, 134 Curve Street, Millis, MA for an honorable (proper) retirement. All size American Flags accepted. 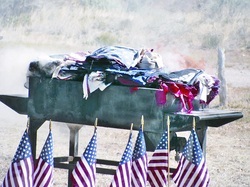 The American Legion will conduct a reverent, private ceremony for the proper disposal of the flags.